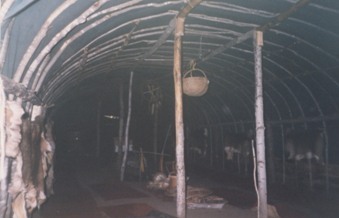 Chapter 2 of Animism: Respecting the Living World engages with various aspects of Ojibwe language. These include the grammatical distinction between animate and inanimate genders, seasonal stories and story-telling, ceremonies, greetings and the meaning of “living well”. 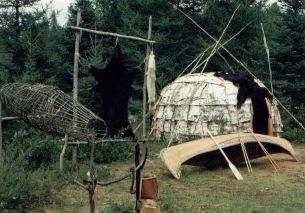 So far, almost every significant discussion of animism (of the “new” kind) at least refers to the work of Irving Hallowell among the Ojibwe of Beren's River and what he learnt about Ojibwe animism. I'll say no more about that here because there's plenty about Hallowell in the book and the point of this website is to enhance the discussion rather than repeat it. I'll be glad to add references to Ojibwe animism whenever I'm introduced to them. 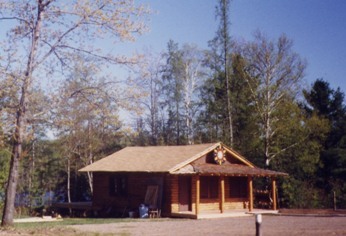 For now, though, I only propose to illustrate parts of my learning experience among Ojibwe hosts at Lac du Flambeau, Wisconsin, USA, and elsewhere. 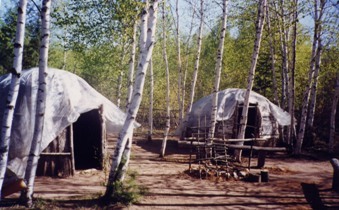 First of all, I've spent some happy and significant times at Waswagoning, a recreated traditional village near Lac du Flambeau. I'm grateful to Nick and Charlotte, and Linda and Bob, who do important and beautiful things there. Click here for Waswagoning's website (but I think its being improved at present and shows a nice picture of somewhere entire elsewhere just now! In the meantime, click here for a good interview with Nick Hocking and some photos). 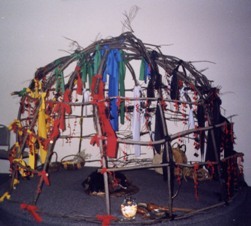 Education about Ojibwe culture and language also takes place at the reservation school. 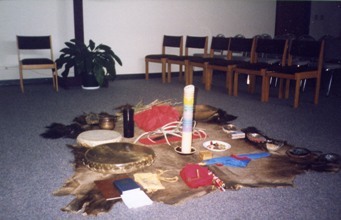 Ojibwe animism is not only in evidence among "traditionalists", a Roman Catholic church in the Twin Cities also demonstrates a degree of Lakota and Ojibwe respect for all living beings, persons. I had the privilege of collecting sage with the community. Any doubts about the vitality of respectful behaviour towards plant-persons disappeared as offered appropriate greetings and gifts before, during and after picking sage for the community's needs. I'm not adding pictures of that because I didn't take pictures while we were picking (partly because I was busy but mostly because it was a sacred event and I don't photograph ritual). So, while I have photos from afterwards they're of people standing beside car loads of sage while we had a drink.